RPGShop is pleased to release the sixth wave of starship expansions for X-Wing the galaxy’s Scum and Villainy will join the game’s fast-paced space battles as its third faction! The ranks of the Scum and Villainy faction are filled with many of the Star Wars galaxy’s most notorious bounty hunters, pirates, and Black Sun agents. You’ll find such infamous figures as Boba Fett, IG-88, Greedo, and Prince Xizor. These Scum live outside the law, do their best to remain at the periphery of the ongoing Galactic Civil War, and allow no one – no one – to threaten their profits. Whenever Rebel or Imperial forces dare to interfere with their illicit dealings, Scum head to battle, and they do so in some of the best starfighters that money can buy, such as Slave I , IG-2000 , and the MandalMotors StarViper -class attack platform. These expensive and technologically advanced starships are further supported by a number of mainstays that have proven their efficiency over the course of numerous battles. These four Wave VI expansions establish the Scum and Villainy faction as a collection of individuals bound by common interests, but ultimately less interested in teamwork and collective victories than personal gain. Accordingly, the faction’s unique pilot abilities encourage different types of squadrons than those commonly employed by Rebel and Imperial players. Moreover, while credits can buy ships, credits can also improve them, and many Scum upgrade their ships with expensive and illicit technologies, several of which are represented by a new type of upgrade, the illicit upgrade, . As far as the galaxy’s Scum are concerned, if the Empire bothered to make such technology illegal, it must be potent. How does a new faction enter X-Wing with enough firepower to take the fight to Rebel and Imperial forces? It starts with the Most Wanted Expansion Pack and its slate of thugs, hired guns, pirates, and spice runners, as well as a new version of the galaxy’s most feared bounty hunter, Boba Fett . 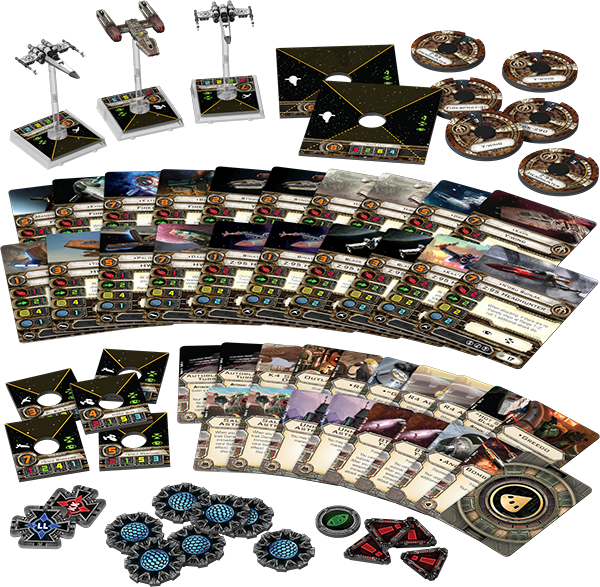 So that you can pilot your ships, Most Wanted introduces twenty ship cards, the most for any X-Wing release to-date. It also allows you to upgrade your starships by outfitting them with any of its nineteen upgrade cards, including a host of new Salvaged Astromech upgrades , modification and Title upgrades for your Y-wings, new secondary weapons (one of which is illicit), and a trio of Scum only crew members that includes the infamous Rodian bounty hunter, Greedo . With all of its ships, pilots, upgrades, dials, and tokens, the Most Wanted Expansion Pack comes with everything that you need to send your Scum into battle and derive a profit from your illegal investments! Designed by MandalMotors in direct collaboration with Prince Xizor, the StarViper -class attack platform was one of the most formidable fighters in the galaxy. 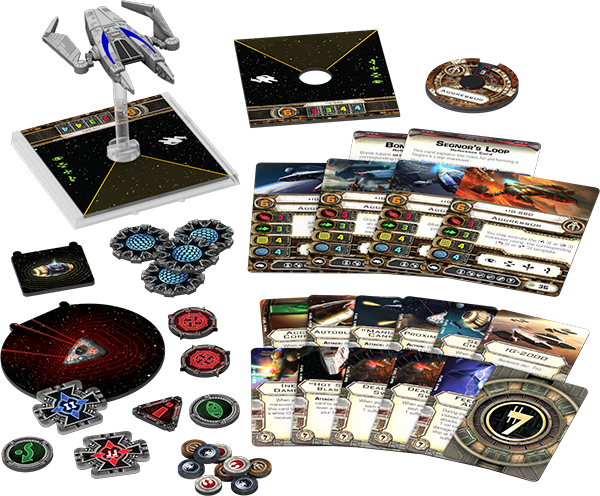 The StarViper Expansion Pack features one pre-painted StarViper miniature, sculpted at 1/270 scale and brought to life in X-Wing as a potent, well-balanced ship that can quickly destroy opposing ships even while evading enemy fire. Dual laser cannons provide the StarViper a primary attack value of three, which is partnered with an agility value of three, shields of one, and a sturdy hull value of four. To these already impressive statistics, the StarViper adds a uniquely loaded maneuver dial and an action bar that features both the barrel roll and boost actions, allowing you to dart about the battlefield with ease. Naturally, you’ll be able to field Prince Xizor in the Virago , the prototype StarViper that he helped design. Outfitted with even more advanced technology than standard StarVipers, the Virago Title allows you to make use of the various system and illicit upgrades, like the Accuracy Corrector and Inertial Dampeners , that appear among the expansion pack’s nine upgrade cards. The lightest starfighter designed by MandalMotors, the M3-A “Scyk” interceptor featured a weapon mount capable of handling nearly any weapon and a price tag low enough that the Hutt Cartel and Car’das smugglers were enticed to purchase it in large quantities and make it a mainstay of their fleets. The M3-A Interceptor Expansion Pack includes one M3-A interceptor miniature, which comes pre-painted and sculpted at the game’s standard 1/270 scale. A light and nimble vessel, the M3-A interceptor starts with two attack, three agility, two hull, and one shield. However, the expansion pack’s five upgrades include the “Heavy Scyk” Interceptor Title and no fewer than three cannons, meaning that you’ll find plenty of options for adapting your Scyk to fit the role you want it to play within your fleet. 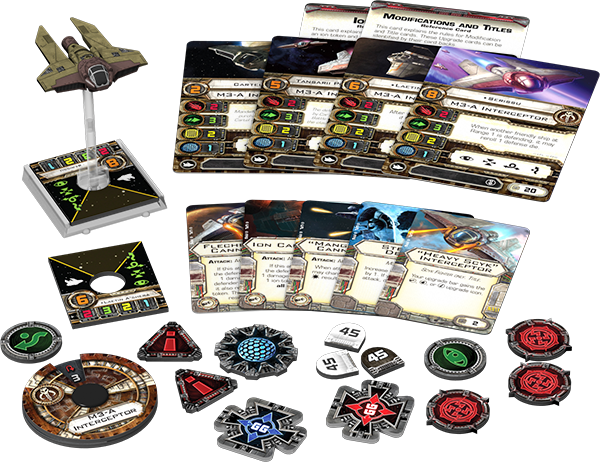 Additionally, the M3-A Interceptor Expansion Pack introduces two unique and two non-unique ship cards, a maneuver dial, and all requisite tokens. Because IG-88 had no need for life support systems and no reason to fear the gravitational effects of maneuvers that would kill organic pilots, the majority of the space within the IG-2000 was devoted to engines and weapon systems, making the starfighter every bit as fearsome as its ruthless pilot. In X-Wing , the IG-2000 is a powerful, large-base starfighter with three attack, three agility, four shields, and four hull. It can boost, it can evade, it can target lock, it can equip two cannons simultaneously, and it can whip through space at high speeds while performing the demanding Segnor’s Loop maneuver. The IG-2000 Expansion Pack features one carefully detailed and pre-painted IG-2000 miniature at 1/270 scale, along with four ship cards, twelve upgrade cards, a maneuver dial, and all the tokens you need to hunt down your prey and obliterate it. Notably, the IG-2000 Expansion Pack is the first X-Wing expansion that doesn’t feature any non-unique ship cards. Instead, each of its four ship cards represents one of the four identical IG-88 models that share a single mind. They all share the same pilot skill value of “6,” and the non-unique IG-2000 Title upgrade allows you to link their abilities. The more IG-88s you bring into battle, the more lethal they become. Throughout the classic Star Wars trilogy, we catch several glimpses of the galaxy’s Scum and Villainy. We see them in Mos Eisley, gathered aboard the command deck of the Executor , and amassed at Jabba’s palace on Tatooine. They may do their best to remain outside the conflicts of the Galactic Civil War, but they form an integral part of the Star Wars universe, exerting profound influence over the lives of millions, including many of the Rebel Alliance’s greatest heroes. 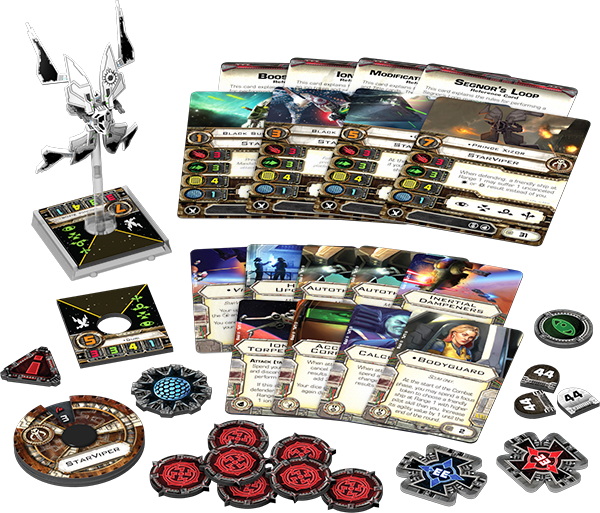 Likewise, the galaxy’s Scum and Villainy will soon form an integral part of your X-Wing experiences, exerting a profound effect upon the game’s evolving metagame. How will TIE swarms fare against squads led by IG-88 and the Virago ? How will X-wing and B-wing pilots used to the TIE’s limited firepower cope with Scum squads that equip the nimble Scyk with potent laser cannons? What will happen when the Black Sun outbids the Empire for the services of Boba Fett , the galaxy’s deadliest bounty hunter? You’ll soon have the opportunity to explore these situations in your games of X-Wing . The Most Wanted , StarViper, M3-A Interceptor, and IG-2000 Expansion Packs are all scheduled to arrive at retailers in the fourth quarter of 2014. 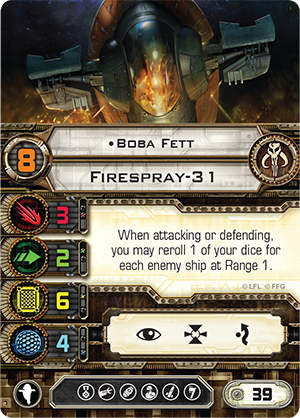 In the meantime, keep your eyes open for previews of these new Wave VI expansions and other X-Wing news!